Art is my passion and joy, something that I feel compelled to do. Whether it’s a play of light and color in nature, people interacting, traveling to new places, or the awe-inspiring beauty of a landscape that leaps out at me, I find inspiration everywhere. Sometimes it’s just a brief moment that “needs” to be translated into art, something captured and put on paper or canvas and shared. Before I even begin a painting, I put something on the canvas or paper, something that is the first of my own “marks” on the blank surface. On watercolor paper, I usually begin with a pale yellow wash; on canvas, gesso and a brush to leave signs that I have been there even before the first oil or acrylic paint touches the canvas. There are days when I like to add beach sand to the gesso, just to add texture and to begin “creating”. Generally I draw loosely in pencil, though sometimes I draw with a brush. I like to see how the composition looks on the actual surface. I also think about what story each specific painting will tell. Sometimes the story changes, and it becomes entirely different. I’m always open to that, and happily go where the painting leads me. If I can paint from life, I do. A still life set up in my studio is ideal, though I often work from photographs with the memory of what I am painting still vividly in my mind. I work with watercolor with its subtle movements of pigments in water, creating fresh and vibrant compositions. I thoroughly enjoy making rich and bold images with acrylics. I love the excitement and challenges of experimenting in all mediums and allowing myself to be completely open to anything, moving in any direction. Nothing however, is as transporting as painting a landscape en plein air. Light and atmosphere; color, shadows, and reflections; experiencing the sky, the water, or wildlife---these are some of the sights and sounds that I am drawn to while I paint my own interpretations on canvas or paper. But mostly I simply enjoy painting with my heart. The moment everything else in the world disappears, and I become focused only on the paint pigments, paper, canvases or whatever I am working with is one of pure joy. Not much is more fun than being in my studio with paints and brushes, knowing that the joyful moment will appear when I am open to it. This is why I paint! Dale Sheldon comes from a family rich in artistic tradition. Born in Philadelphia, she grew up at the Jersey shore where her father and grandfather designed many public monuments, including the New Jersey State monument at Valley Forge, PA. Through high school and college, Ms. Sheldon joined the design group in her family's business and participated in the design and completion of many memorials in the mid-Atlantic region. Ms. Sheldon studied at Philadelphia's Moore College of Art, and graduated with honors from the University of Maryland. "Exploring a variety of subject matters, Dale Sheldon is a painter who works dynamically with a sense of immediacy and luminous color." She is primarily a studio painter, collecting images and impressions from around the world. Exploring light and atmosphere, and color relationships, her paintings interpret and express moods, memories or impressions. Her style of painting with watercolor reflects both wet on wet and layering techniques with rich color washes, while fluid acrylic paintings with masking techniques creates flat and bold graphic images. 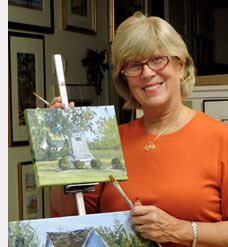 An award-winning artist, she is a member of Potomac Valley Watercolorists, a founding officer and signature member of the Delaware Watercolor Society, and a signature member of Baltimore Watercolor Society. Exhibitions include solo shows at Coastal Frameshop and Gallery in Rehoboth Beach, DE, "Art for Life, Hope for our Children" at Washington DC's Museum of the Americas and the World Health Organization, and the Cultural Center of the Embassy of Egypt. She was a participating artist in Rehoboth Beach’s “Dolphins:the SEAquel”, a Rehoboth Beach Main Street/Rehoboth Art League installation project. Dale’s paintings were part of an international exhibition shown in Cairo, Egypt, and she has shown in Greve in Chianti, Italy. Her paintings can be seen at Gallery One in Ocean View, DE, the Rehoboth Art League in Rehoboth Beach, DE, and in various other shows, exhibitions, and private collections.